Heaven 42 is a high-white (CIE = 157), coated fine paper of Scheufelen in Lenningen in Baden-Württemberg, Germany. Heaven 42 is especially suitable for technical motifs (shades of gray, silver tones from 4c, strong chiaroscuro contrasts). These perform on Heaven 42 particularly brilliant and neutral. For warm tones (z. B. skintones) color adjustments are recommended. With intense printing experiments it was found that the ICC profile provided on www.heaven42.com can be used. This profile, we can also reproduce in the proof. The absolutely white paper shade of heaven 42 has effects in printung – as well as prepress. With an unchanged separation (eg with ICC profile “ISOcoated_v2”), the printed image with the same color and dot gain affects considerably colder. This property is good for the implementation of technical designs. For pictures of people and skin tones, however, the high degree of whiteness results in a noticeable blue tint. Therefore, an adjustment of the colors to the desired color appearance is required. 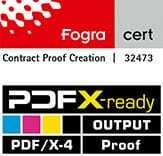 The Proof GmbH is able to deliver proofs of Scheufelen Color Profiles for Heaven 42. The proofs are printed on paper with optical brightning agents (OBA) and measured in M1 mode taking into account the optical brighteners.